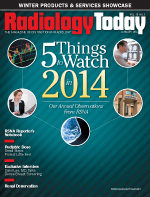 Editor’s note: This article is based on materials distributed for the press conferences at RSNA 2013 in Chicago. Using digital breast tomosynthesis (DBT) led to reduced recall rates and an increase in cancer detection in a large breast cancer screening program, according to a study presented at RSNA 2013. Digital mammography is the gold standard for breast cancer screening but yields false-positive findings associated with a higher recall rate for additional imaging or biopsy. However, unlike conventional 2D mammography, DBT allows for 3D reconstruction of the breast tissue, which then can be viewed as sequential slices through the breast. For the study, Conant and colleagues compared imaging results from 15,633 women who underwent DBT at the Hospital of the University of Pennsylvania beginning in 2011 with those of 10,753 patients imaged with digital mammography the prior year. Six radiologists trained in DBT interpretation reviewed the images. The researchers found that, compared with digital mammography, the average recall rate using DBT decreased from 10.4% to 8.78%, and the cancer detection rate increased from 3.51 to 5.24 (per 1,000 patients). The overall positive predictive value increased from 4.1% to 6% with DBT. Conant noted that tomosynthesis is an evolving platform, and researchers already are seeing a significant improvement in important screening outcomes. Patients who underwent more frequent screening mammography had a significantly lower rate of lymph node positivity compared with women who went for longer intervals between screening mammography exams in a study of screening mammography-detected breast cancers. Results of the study were presented at RSNA 2013. Historically, health care organizations such as RSNA and the American Cancer Society have recommended annual screening with mammography for women beginning at age 40. However, in 2009, the US Preventive Services Task Force (USPSTF) announced a controversial new recommendation for biennial screening for women between the ages of 50 and 74. “Our study looks at what would happen if the revised guidelines issued by USPSTF were followed by women,” Wang said. The retrospective study, conducted at Northwestern Memorial Hospital, included 332 women with breast cancer identified by screening mammography between 2007 and 2010. The women were divided into one of three groups based on the length of time between their screening mammography exams: less than 1.5 years, 1.5 to three years, and more than three years. There were 207, 73, and 52 patients in each category, respectively. Controlling for age, breast density, high-risk status, and a family history of breast cancer, the researchers determined that women in the less than 1.5 years interval group had the lowest lymph node positivity rate at 8.7%. The rate of lymph node involvement was significantly higher in the 1.5- to three-year and over three-year interval groups at 20.5% and 15.4%, respectively. Healthy adults who consumed energy drinks high in caffeine and taurine had significantly increased heart contraction rates one hour later, according to a study presented at RSNA 2013. A 2013 report from the Substance Abuse and Mental Health Services Administration stated that in the United States from 2007 to 2011, the number of emergency department visits related to energy drink consumption nearly doubled, increasing from 10,068 to 20,783. Most of the cases were identified among patients aged 18 to 25, followed by those aged 26 to 39. For the study, which is ongoing, Dörner and colleagues used cardiac MRI to measure the effect of energy drink consumption on heart function in 18 healthy volunteers, including 15 men and three women with a mean age of 27.5 years. Each of the volunteers underwent cardiac MRI before and one hour after consuming an energy drink containing 400 mg of taurine and 32 mg of caffeine. Compared with the baseline images, results of cardiac MRI performed one hour after the study participants consumed the energy drink revealed significantly increased peak strain and peak systolic strain rates (measurements of contractility) in the left ventricle of the heart, which receives oxygenated blood from the lungs and pumps it to the aorta, which distributes it throughout the rest of the body. The researchers found no significant differences in heart rate, blood pressure, or the amount of blood ejected from the left ventricle of the heart between the volunteers' baseline and second MRI exams. Dörner said that while long-term risks to the heart from drinking energy drinks remain unknown, he advises that children and people with known cardiac arrhythmias should avoid energy drinks because changes in contractility could trigger arrhythmias. He also cautions that additional study is needed to address risks posed by the consumption of energy drinks in combination with alcohol. Using a special type of MRI, researchers have found that soldiers who suffered mild traumatic brain injury (MTBI) induced by blast exposure exhibit long-term brain differences, according to a study presented at RSNA 2013. Recent wars have resulted in veterans with an exposure rate of approximately 20% to blast-induced MTBI, or trauma resulting from mortar fire and improvised explosive devices. Diagnosis can be challenging, especially in mild cases. One of those methods is diffusion tensor imaging (DTI), an MRI technique used to identify microstructural injury to white matter, the part of the brain that consists mostly of signal-carrying axons. Damage-associated changes in water movement along the axons are comparable in certain respects with what might happen with a garden hose, according to coauthor Thomas M. Malone, BA, a research associate at Saint Louis University School of Medicine. “As water passes through the hose from the faucet to the sprinkler, it goes in the same direction, but if you were to puncture the hose with a rake, the water would shoot out the sides,” he said. Comparison of FA values showed significant differences between the two groups, and there were significant correlations between FA values and attention, delayed memory, and psychomotor test scores. Since the victims were, on average, more than four years removed from their injuries, the results suggest the presence of a long-term impact of blast injury on the brain. “This long-term impact on the brain may account for ongoing cognitive and behavioral symptoms in some veterans with a history of blast-related MTBI,” Roskos said. Roskos explained that this research is aimed at finding better ways for clinicians to differentiate between MTBI and posttraumatic stress disorder (PTSD) in veterans in order to improve treatment. Focused ultrasound under MR guidance may offer a safe and effective noninvasive treatment for breast cancer, according to research presented at RSNA 2013. MR-guided focused ultrasound (MRgFUS) ablation requires no incision or puncture to perform. Instead, it uses the acoustic energy from high-intensity focused ultrasound to heat and ablate diseased tissue. Continuous MRI is used to locate the lesions and monitor the temperature change during the process. The primary potential advantages of MRgFUS over other breast cancer treatments are is that it is a noninvasive, outpatient procedure offering a quick recovery time, and precise measurement of temperature changes during the procedure. Napoli and colleagues assessed the safety and efficacy of MRgFUS in 12 patients with invasive ductal breast cancer before surgical removal of the cancer and biopsy of the lymph nodes. They used 3T MRI to confirm the presence and treatable location of cancerous lesions. The patients then underwent single-session MRgFUS treatment. Researchers evaluated treatment efficacy through postsurgery pathology. None of the patients experienced significant complications during or immediately after the procedure. In 10 of the 12 patients, MRI showed no enhancement in the treatment area after the procedure. Postsurgery histological evaluation confirmed the absence of residual disease in the treatment area in those 10 patients. In the other two cases, treatment failed because of transducer malfunction, and the pathologist observed residual tumor in the samples. While the initial results are promising, Napoli cautions that more research will be needed before the approach can be adopted as a stand-alone treatment. Automated breast density measurement predicts breast cancer risk in younger women, and that risk may be related to the rate at which breast density changes in some women as they age, according to research presented at RSNA 2013. Breast density, as determined by mammography, already is known to be a strong and independent risk factor for breast cancer. The American Cancer Society (ACS) considers women with extremely dense breasts to be at a moderately increased risk of cancer and recommends they talk with their physicians about adding MRI screening to their yearly mammograms. “Women under age 50 are most at risk from density-associated breast cancer, and breast cancer in younger women is frequently of a more aggressive type, with larger tumors and a higher risk of recurrence,” said the study's senior author, Nicholas Perry, MBBS, FRCS, FRCR, director at the London Breast Institute in the United Kingdom. Perry and colleagues compared breast density and cancer risk between younger and older women and then analyzed how the risk relates to changes in breast density over time. The study group included 282 breast cancer cases and 317 healthy control participants who underwent full-field digital mammography, with breast density measured separately using an automated volumetric system. Breast cancer patients showed higher mammographic density than healthy participants up to the age of 50. The healthy controls demonstrated a significant decline in density with age following a linear pattern, while there was considerably more variability in density regression among the breast cancer patients. For instance, some women might undergo a modified exposure exam at age 35 to establish breast density levels, Perry said. Those with denser breast tissue then could be followed more closely with mammography and additional imaging such as MRI or ultrasound for earlier cancer detection and treatment. Researchers have used radioimmunotherapy (RIT) to destroy remaining HIV-infected cells in the blood samples of patients treated with antiretroviral therapy. The approach could provide a strategy for curing HIV infection, according to research presented at RSNA 2013. Highly active antiretroviral therapy (HAART) has transformed the outlook for patients infected with HIV by suppressing the replication of the virus in the body. However, despite its success, scientists believe reservoirs of latently infected cells persist in the body, preventing the possibility of a permanent cure. An important part of the study tested the radiolabeled antibody’s ability to reach HIV-infected cells in the brain and central nervous system. Using an in vitro human blood-brain barrier model, the researchers demonstrated that radiolabeled mAb2556 could cross the blood-brain barrier and kill HIV-infected cells without any overt damage to the barrier itself. Dadachova said clinical trials in HIV patients are the next step in evaluating the treatment. MRI provides a noninvasive way to measure iron levels in the brains of people with ADHD, according to a study presented at RSNA. Researchers said the method could help physicians and parents make better-informed decisions about medication. ADHD affects 5% of school-age children, according to the American Psychiatric Association. Psychostimulant medications such as Ritalin are among the medications commonly used to reduce ADHD symptoms. Psychostimulants affect levels of dopamine, a neurotransmitter in the brain associated with addiction. The results showed that the 12 ADHD patients who had never been on medication had significantly lower MFC than the 10 ADHD patients who had been on psychostimulant medication or the 27 typically developing children and adolescents in the control group. In contrast, no significant group differences were detected using relaxation rates or serum measures. The lower brain iron levels in the nonmedicated group appeared to normalize with psychostimulant medication. MFC imaging's ability to noninvasively detect the low iron levels may help improve ADHD diagnosis and guide optimal treatment. Noninvasive methods particularly are important in a pediatric population, according to Adisetiyo. “This method enables us to exploit inherent biomarkers in the body and indirectly measure dopamine levels without needing any contrast agent,” she said.